Indian stock markets gained traction in 2013. The hope of formation of a stable government at the Centre saw the beginning of a rally that is now being compared with the bull run of 2003-08. Just before that, negativity was at its peak with sharp depreciation of the rupee and widening government deficits. Stock market valuations reflected this. But then, expectations that things will change became the central theme. In this scenario, a number of institutions and individuals did exceedingly well, not only by providing better risk-adjusted returns to investors but also by ensuring their overall financial well-being. To recognise and honour them, we bring the second edition of the Money Today FPCIL Awards 2013-14. 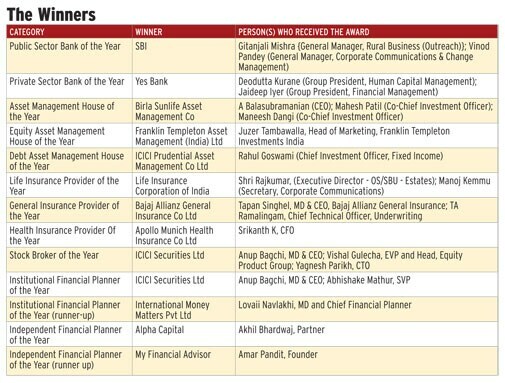 The awards have been jointly instituted by Money Today, the personal finance magazine of the India Today Group, and the Financial Planning Corporation (India) Pvt Ltd (FPCIL), established by the Financial Planning Standards Board India. The awards have been powered by Certified Financial Planner (CFP) Certification, a global mark of Excellence in Financial Planning. DHC, a leading accounting and consulting firm, is the knowledge partner. "The purpose of these awards is to recognise entities and individuals who have provided best products and services in their respective fields to the highest satisfaction to their consumers," Sarbajeet Sen, managing editor, Money Today, said at the award ceremony. "We hope this will set new benchmarks in customer service and product innovation across the financial services spectrum," he said. "We at Money Today are committed to arm our readers with smart and efficient tools of money management. 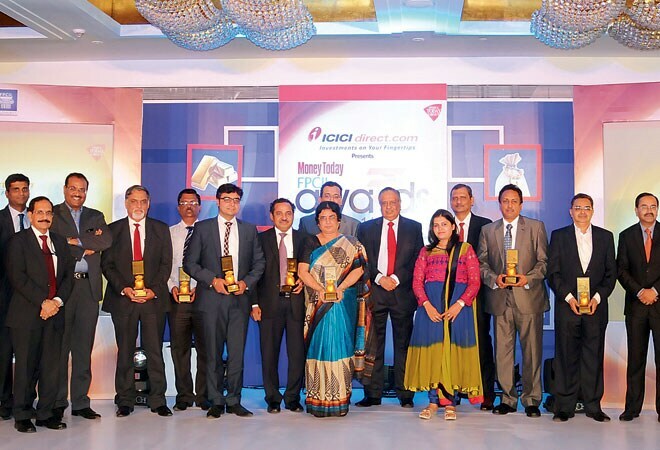 Along with FPCIL, which lives and breathes financial planning, we together can understand the pulse of the market and requirements of consumers and are ideally placed to give away these awards," he said. Ranjeet Mudholkar, CEO and vice chairman, FPSB India, said the awards are broad-based and have a two-pronged approach. On the one hand they cover the financial services sector as regard to design of products, governance and intermediation involved in delivery while on the other hand they capture the outcome, that is, the financial well-being of consumers who use these products and achieve their objectives. All in all the awards look at the entire value chain rather than seeing any process in isolation, leading to convergence of all asset classes from the perspective of the financial consumer. Mudholkar spoke about the sweeping reforms in the financial services sector through the Financial Sector Legislative Reforms Commission. He also spoke about the importance of financial advisory in the value chain. The awards followed the highest standards of integrity, research and fair analysis. The awards have the endorsement of seven eminent jury members who have arrived at the winners after rigorous examination. The members are experts in areas of banking, law, financial services and accountancy. Together they have provided valuable inputs for selecting winners. "We have one of the finest juries for selecting the winners," said Sen. The chairman of the jury, Justice (Retd) Shri BN Srikrishna, is an eminent jurist and a former judge of the Supreme Court. Till recently, he was Chairman of the Financial Sector Legislative Reforms Commission (FSLRC), established by the finance ministry in March 2011 to simplify financial sector and subordinate legislation. Amitabh Chaturvedi, a jury member, is the managing director at Essel Finance. He has over 22 years of experience in banking, asset management, insurance, broking and distribution. Gautam Chikermane, another member, is an eminent journalist, columnist and author as well as Jefferson Fellow. He has over the years served as editor at many esteemed publications. Another jury panellist is Naresh Takkar, managing director and CEO of ICRA Ltd. He has led ICRA's teams for developing analytical criteria for various sectors, including banking, project finance and structured finance. Jury panelist Ranjeet S Mudholkar is serving as vice chairman and CEO of the Financial Planning Standards Board India (FPSB India). Sandeep Parekh, a member, is the founder of Finsec Law Advisors, a financial sector law firm based in Mumbai. He has also served as executive director at the Securities and Exchange Board of India, where he headed legal affairs and enforcement departments. Jury member Shailesh Haribhakti is a Fellow Chartered Accountant and Chairman at DH Consultants Pvt Ltd, a leading accounting and consulting firm. The chief guest of the award ceremony was M Damodaran, who served as the chairman of Sebi, India's financial markets regulator, for three years up to February 2008. "At Sebi, he brought about major improvements in the regulatory framework of capital markets," said Sen. "He was also the architect behind restructuring of IDBI, a development finance institution, which he converted into a bank," he said. Damodaran was also chairman of Unit Trust of India, then India's largest mutual fund, from July 2001 to December 2004. He belongs to the Indian Administrative Service and served as joint secretary of the banking division of the finance ministry for five years. Damodaran, in his address, said one is always learning and even for a personality like him there is always something to take away from such events. He expressed his confidence in the jury, which he called most distinguished, and said he was impressed by the process and methodology followed for the awards. Damodaran said the financial sector has done a lot of good and some harm. Excessive financialisation, he said, has contributed to lot of negativity. He said the solution to all problems that exist in the financial sector is to create a body of informed investors who know what they are doing with their money. There are many who don't understand asset classes or risks associated with them and blindly follow advice of others. He urged investors to seek advice and understand products. This is also true for manufacturers of products. Kartik Radia, deputy national leader, Risk Advisory, and partner at DHC, said the entire process has been holistic. He said they have used an internationally recognised methodology called CAPA, a 360-degree evaluation which delves into detailed aspects of a company's functioning to make sure the process is not affected by any prejudice and is scientific. 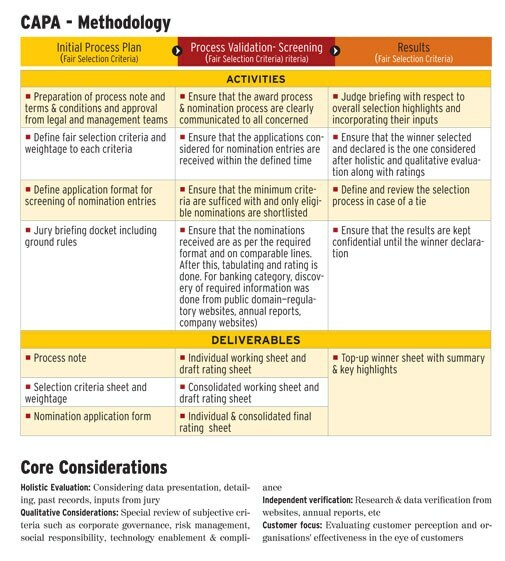 "The selection process did a holistic evaluation of nominees that included quantitative and qualitative evaluation, backed by independent validation and customer focus," said Radia. Holistic Evaluation: Considering data presentation, detailing, past records, inputs from jury Qualitative Considerations: Special review of subjective criteria such as corporate governance, risk management, social responsibility, technology enablement & compliance Independent verification: Research & data verification from websites, annual reports, etc Customer focus: Evaluating customer perception and organisations' effectiveness in the eye of customers.